The Nets' emerging star guard expects to play again this season, although he does not have a timetable in mind that he wishes to share. Caris LeVert walked the length of the Nets’ Industry City practice court on crutches. He set aside the crutches, sat on a raised chair and declared himself “blessed” after suffering an injury that looked worse than it ended up being. LeVert is averaging 18.4 points, 4.3 rebounds and 3.7 assists per game. The Nets left after practice for Miami, where they will face the Heat on Tuesday before visiting Dallas on Thanksgiving Eve. LeVert, who had three foot surgeries while at Michigan, did not travel with the team. He was relieved to have flown back with the team from Minneapolis after suffering the injury, although he said he doesn’t remember much about the flight because he slept a lot. 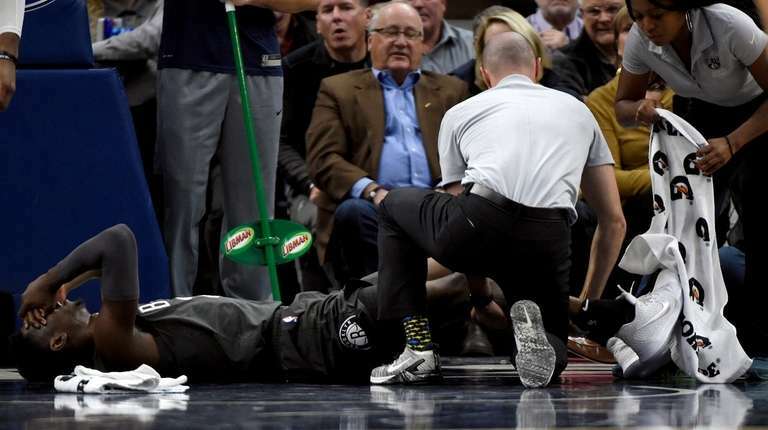 Later that night, however, LeVert did not sleep, because even though early indications were hopeful, he knew he had to undergo tests back in New York to confirm the diagnosis. Fortunately for the 24-year-old, the doctors agreed that rehab and not surgery was the prescription. LeVert’s predicament led to an outpouring of support from his peers in the NBA, including a social-media message from LeBron James. LeVert said he was surprised that a few NBA stars who reached out had his phone number. Another thing to feel blessed about.